Currently Dashur is one of the best places to see large pyramids, because it has few visitors, yet is not a far drive from Cairo. 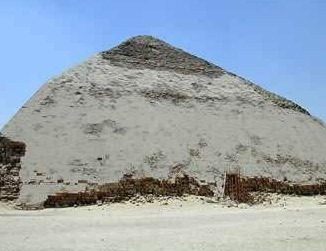 Located in South Saqqara stand the pyramids of Dhashur (Dahshur). The Red Pyramid and the Bent Pyramid are about 2 km south of the Mastaba Faraoun. The constructor of these pyramids is thought to have been Snofru (2575 - 2551 BC), who was the first ruler of the 4th Dynasty. Snofru built these two pyramids and is thought to have built the pyramid at Maidoun. His son was Cheops who continued his constructive tendencies. The Red Pyramid is thought to be older and is the only one that can be entered at this time.. The Bent Pyramid was built out of limestone which was quarried locally. The casing was of polished Turah limestone. This pyramid is also known as the Southern Shining Pyramid. The casing blocks are very stable and very difficult to remove because they slope inwards. 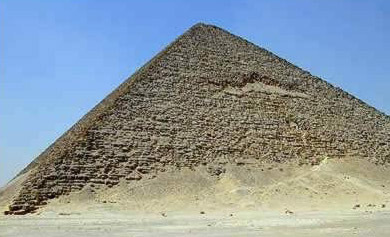 The base of the pyramid is 188.6m and is 105m high. Because of the bend in construction, the original angle would have made it 128.5m high. The Bent Pyramid is unique for two reasons. The first is the angle change. There are two theories for this change. The first is that the builders may have gotten tired and wanted to reduce the volume and to finish faster. Another is that when the pyramid at Maidoun collapsed, the architect lost his nerve and changed the angle. The angle at Maidoun was 52 degrees as is the base of the Bent Pyramid. At the bend, the angle is changed to 43.5 degrees up to the peak. The second reason is that it has two entrances. The first is in the middle of the northern side and is about 12m above the ground. It leads to the upper chamber. The second entrance is on the western side and is just above the ground. It leads to the lower chamber. The floors of both chambers were built 4m deep with small stone blocks. 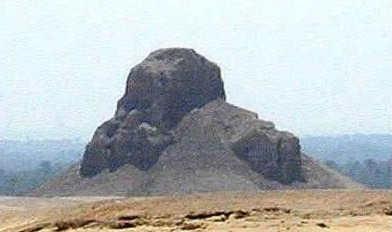 About a mile from the Bent Pyramid, but not approachable is the Pyramid of Amenemhet III. Originally, it was 341 feet square by 266 feet high, but as a mudbrick pyramid lined with limestone, it has deteriorated badly.